Democrat Joe Radinovich and Republican Pete Stauber went back and forth Friday on everything from President Trump and health care to their own personal controversies cropping up in the highly contested 8th District race. 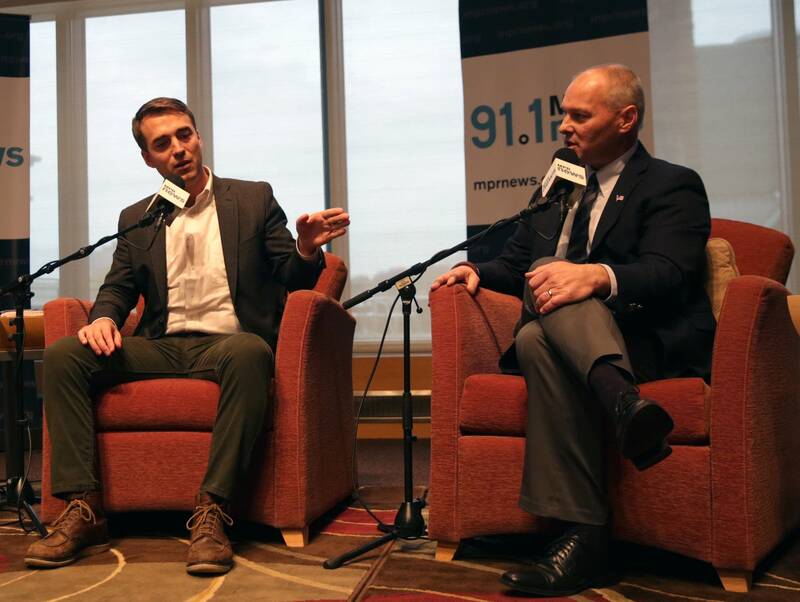 It's one of the most-watched congressional races in the nation, and the major party candidates didn't hold anything back, frequently interrupting each other during an hour-long debate on MPR News. The 8th District, which stretches from the northern Twin Cities suburbs to the Canadian border, is open after current DFL Rep. Rick Nolan decided to retire. Outside groups battling for control of Congress have already spent roughly $10 million in the district to influence voters on Nov. 6. Ray "Skip" Sandman is also running in the district as an Independence Party candidate. Here's what the top two candidates talked about and where they stand on the issues. President Donald Trump is popular in Minnesota's 8th District, where he beat Hillary Clinton two years ago by 15 percentage points. Stauber said he supports the president on issues like jobs and the economy, but he would have pushed harder to include funding for Great Lakes restoration in the president's first budget bill. And he disagreed with a move to remove sanctions from Chinese telecom giant ZTE, a company that U.S. intelligence officials have suggested could post a risk to the nation's security. "I agree with his economic response," Stauber said. "He's got really good business sense and he's propelling it with his administration." Radinovich said he would have pushed back on the president's tax cut bill because it mostly benefited the wealthy. "The president has espoused a view that he should give 80 percent of the tax bill that was passed in January to 1 percent of income earners," he said. But he does agree with the president's desire to increase infrastructure spending across the nation. "I have an obligation to work with the president on issues that we have in common," he said. Some of the biggest clashes in the race came on the issue of health care, where the two candidates have widely diverging views on how to fix rising costs for average citizens. Radinovich has fully embraced a public system, where people buy into a government-run plan. He argues it's more efficient and accountable than a profit-driven system. "This is an issue we have an ability to fix in this country," he said. "We pay more per person than any other country in the world. We will not be able to do this while we still have a profit motive in this system." Stauber was critical of a public plan, which he called the "Medicare-for-all scheme," saying it will bust the nation's budget. He said health care is an "essential benefit" that is needed by everyone, but he doesn't support a plan to take a "sledgehammer" to the nation's system. Stauber said a project like PolyMet, a proposed copper-nickel open pit mine near Hoyt Lakes, would bring economic impacts similar to the Super Bowl each year in northern Minnesota. He was critical of his opponent, Radinovich, who he said "waffles" on his support for copper nickel mining. Copper-nickel mining has never been done in the area, and the proposed projects are controversial, with many residents concerned about possible negative environmental impacts. Radinovich pushed back, saying he supports mining projects "that can meet state and federal standards." "There are two candidates that are pro mining in this race," he added. Both candidates are facing controversies in the race. The DFL Party is pushing St. Louis County, where Stauber serves as a commissioner, to release more than a dozen emails Stauber wrote from his county address to a Washington-based political group. It's illegal to use official resources for political business. When asked why he won't release the emails, Stauber said the county investigated the issue and cleared him of wrongdoing. He said the email issue is being pushed by Radinovich and the state party as a political attack. "It's purely political and partisan," he said. Radinovich said it's about transparency: the county is interpreting the state law wrong and that has resulted in the subsequent lawsuit. "Character is what you do when nobody's looking," Radinovich said. "He could end this just by releasing 15 or 16 emails." Radinovich is facing attacks of his own on more than two dozen parking violations on his record since 2004, as well as a drug paraphernalia charge that was dropped in a plea deal. "I've made mistakes in my life and I think that makes me more human," he said. "I've been transparent," he added. "Pete still can't be transparent about the emails."